Here is a list of a few of my favourite books for UI designers. What is the thought process of designing something? Why is something considered a good design and others not? This book delves into these topics. The examples in this book are not focused on software but everyday things. Why are traffic lights best designed in a column rather than a row? Different people see different things and in different ways. As designers we need to be aware of how our audience and end users will use our product. This book is highly recommended. Where does your inspiration come from? All great artists steal. It’s making something new of that thought is what is important. This book talks about coming with ideas and channeling them to something constructive. It is done in a light way with playful graphics but it makes it all a joy to read. Good afternoon read. This book is a good read to see how you can bring practices of user experience design into organizations where it never existed before. By just doing the user experience design process you are putting structure to some existing practices such as business requirement gathering. However by gathering requirements by listening and observing users you can slow introduce mockups and usability testing to help explain ideas and concepts to users easier. I read this book in 2012 only to realize that I had already read this book back in 2005-2006 when I worked for Toyota. This book highlights what you should should be looking for when you are observing the user and why you are observing the user. User experience design is nothing new but now is a great time to focus on it. How do you know if you are doing user experience right? Do you just feel if things just work? Like everything else in life, if you want to see improvement you need to record it so that you can measure it. This book focuses on how to conduct surveys and how generate reports out of the data gathered. Decent use cases here helps the authors drive their points. This is actually a series of books I read all of them as they are not long read and are packed with tons of information. The topics in the series range from web technologies (HTML5, CSS3), how to use web technologies (responsive design, mobile first) to how you should approach design (designing for emotion, design is a job). I have been following Nathan’s blog for a while and really admire his work. It is not only because his work looks nice but he takes the time to share his technique and tips on how to create the visualizations yourself. Edward Tufte is one of the originals when it comes to making data beautiful so that people would want to consume it. This book is not available in an e-format because the author was persistent that this work was best displayed on the large high quality paper that this book is bound in. Tufte discusses the common pitfalls of graphing mistakes and how to improve on them. When I first saw this book in the book store I had to pick it up. I didn’t know why but the book just looked beautiful. Flipping through the book I saw the colourful infographics and at the moment I said this is something I would like to do as a living. 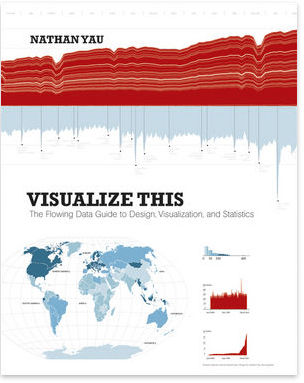 Making information beautiful and telling a story with data is both an art and a skill has it takes knowledge of analysis and stats with a visual eye.